A landowner approached me looking for some advice as to which trees and shrubs to plant to bring more wildlife into her property. Before I could give her a list to procure, I needed to know a bit more about what she is looking to attract and what the conditions are like on their property. This step is critical for anyone looking to attract more wildlife. For any kind of project you are looking to undertake on your property, you need to start with the “why” question. Why are you doing this? What are you hoping to accomplish? And the more specific you can be, the more satisfied you will be with the results that you get. So, when it comes to wildlife, do you want more deer, songbirds, woodpeckers, turtles? Then, take some time to walk around your property and see which trees and shrubs you have that are already attracting wildlife. It may turn out that you just need more of the trees and shrubs that exist now on your property to increase the number of a certain wildlife you are looking for. Most likely, though, you would benefit from improving the diversity within your woodlands by planting some different trees and shrubs. There are a couple of great publications out there that can help you find the right things to plant, including Wisconsin Wildlife Primer and So, What Should I Plant?. Now, that you have a list of potential trees and shrubs to plant, you need to figure out which ones can grow in your soil and climatic conditions. The Natural Resources Conservation Service has a lot of great resources on their website, including a description of the different soil types for your property. You can also call your local UW Extension office, and they will help you prepare and send a sample of your soil to the state lab for analysis. My advice to the landowner that asked about attracting more wildlife, was to choose trees and shrubs to plant that several kinds of wildlife use or feed upon. She mentioned that they already have Hazelnut and highbush cranberry growing on their property, so I recommended adding elderberry in openings and in disturbed areas. The hazelnut and cranberry provide food in the fall and winter while the elderberry is a good source of winter food. All of these shrubs are used by a wide array of wildlife. Additionally, I told her to increase the diversity within their property of trees and shrubs. 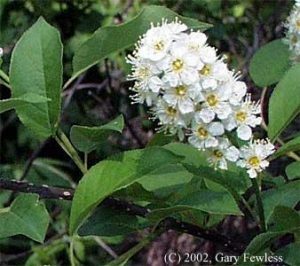 Fruit-bearing trees were missing from her property, and so we discussed planting choke cherry and serviceberry which are also good sources of summer food. She has some nut-bearing trees (oak and butternut), and I encouraged her to harvest any other trees surrounding the oak and butternut so they have plenty of room to grow.